Rhonda Armistead is a contemporary artist from Lismore in the Northern Rivers NSW Australia. Mediums included Oils on Canvas, Fine Line Pen Drawings, Sketches in Pencil and Charcoal, Reduction Plate Lino Prints,and Etchings on Acrylic Plates. Rhonda has taken part in numerous group and solo exhibitions over the past 15 years and worked on many commissioned works. 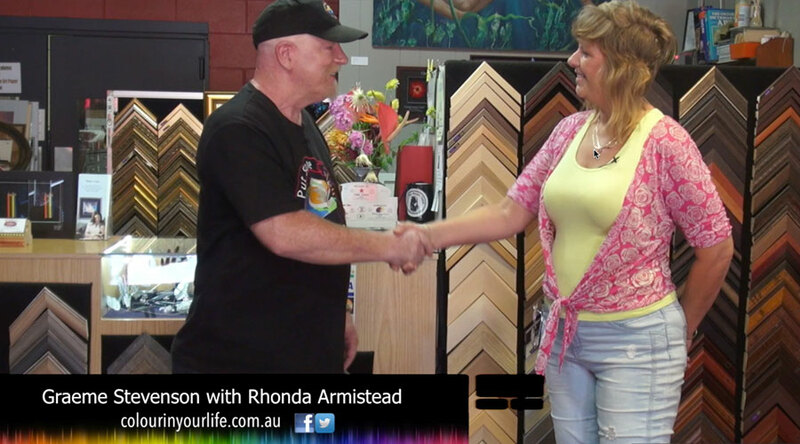 She is a Framing and Exhibition Consultant and Teaches Art Classes at her studio at Armistead’s Picture Framing & Gallery in Lismore (owned by her and partner Derek Armistead). Rhonda has been curating the Lismore Café Trail exhibitions for the past 8 years, supporting and encouraging local emerging Artists of the Region. Her paintings, drawings and prints are held in Private and Corporate collections throughout Australia, Ireland, Spain, Nepal, America and Japan. Rhonda holds lessons in painting and more infor can be found at Lessons with Rhonda. Lessons are continuous and casual, with no structured classes. You bring along the image you want to paint, or we’ll find one together and help you to get the best outcome for your painting. Our goal is to be able to work on Technique, Perspective, Composition and Colour Theory. To recognize these elements in other works and apply the principles to your own work. How to create drama and tension both in the work and with colour. How to see what you want to draw. Mixing your own colour and mediums. General problem solving and critique.